After a long time, Google updated the whole structure of the Gmail. The new look is perfect material design. The new Gmail Look is really interesting. With this update, it is now easy to use the Gmail features. The security of it has been updated also, now it is easy to add two-factor authentication. The compose button has a new look, the menu has got one and last but not least the search box is transparent. In order to get the new Gmail look, your personal Gmail account should be updated. 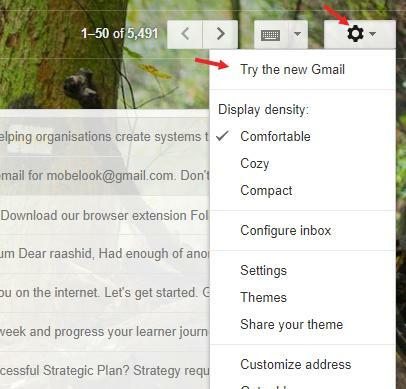 The right way to get the new look is to simply click on the gear icon and then clicking the ‘Try New Gmail Look’. Finally, you will have new Gmail look and if sometimes you need to reverse back to classic design, you can follow the same process.